One of the first results of Britain’s voting to leave the European Union was a sharply lower pound. 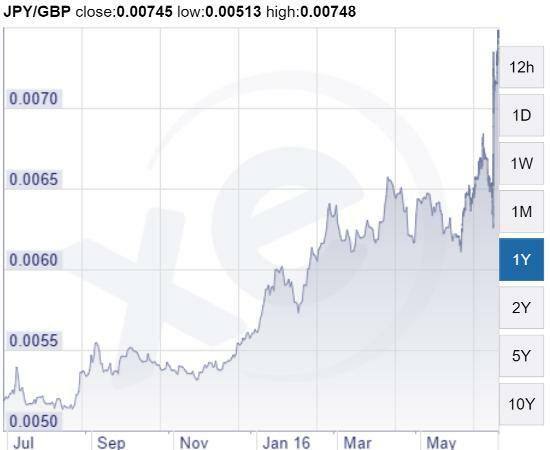 Which means the UK is now winning the currency war. Henceforth its exports will be cheaper around the world, enabling its major companies to sell more stuff, make more money and hire more people. Inflation will pop, lessening the burden of government and consumer debts, and — other things being equal — growth will be faster. (Reuters) – Japanese Prime Minister Shinzo Abe’s limping “Abenomics” revival program suffered a fresh blow on Friday when Britain’s vote to leave the European Union sent the yen soaring and threatened to make companies and consumers even more cautious.The ‘Vote Leave’ campaign claimed unexpected victory over its ‘Britain Stronger in Europe’ rival, after 52 percent of Britons voted to support their plan to leave the 28-nation club. Abe took office in December 2012 pledging to end decades of deflation in Japan and generate growth in an economy plagued by a shrinking, fast-ageing population with a mix of hyper-easy monetary policy, fiscal spending and reforms. But the formula has largely failed. The central bank’s aggressive money-printing has failed to accelerate inflation, and anemic economic growth has discouraged firms from raising wages and households from spending. “In terms of Abenomics, it was already dead in the water. This will certainly sink it a bit further,” said Jeffrey Kingston, director of Asia studies at Temple University’s Japan campus. The yen, seen as a safe-haven currency, soared briefly above 100 to the dollar, prompting Finance Minister Taro Aso to signal a readiness to intervene to stem excessive strength. Japan’s policymakers worry the unwelcome rise in the Japanese currency will hurt exports and drive the economy back toward recession. Bank of Japan Governor Haruhiko Kuroda said the BOJ stands ready to provide ample liquidity to financial markets. Market players fear policy makers have few options left to stem the rise in the yen or to rev-up the faltering economy. The yen had already risen around 15 percent against the dollar this year, threatening corporate profits. “What companies have to do is redraw their investment strategies … with a negative effect overall on the Japanese economy and on globalization, which is the trademark policy of Abenomics,” said Martin Schulz, economist at Fujitsu Research Institute. “Brexit” shock could further dampen corporate and consumer sentiment and spending, already weak spots in the Abenomics mix. Among the results for Japan: more deeply negative interest rates, with all the banking and bond market turmoil that that implies; falling corporate profits; plunging popularity for the current government and probable regime change in the next year or two; a financial crisis when investors figure out that there’s nothing left in the toolbox to stave off the debt/demographics-driven collapse of perhaps the most heavily-indebted government (in relation to its economy) that will ever exist. In a world of potential Lehman moments, Japan just climbed to the top spot.